Another one of my Breakanoid riffs. This time you are the ball! Steering by tapping the left and right keys, striking the bottom will lose you time. 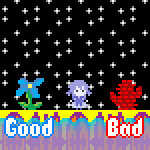 I will probably do a more considered game with all these experiments when I'm finished.